Had very little time for LD34 - made a Pico-8 in a hurry :) Theme = growing. The aim is to merge and grow the evil boxes in order to have one left - then it will collapse due to it's unbearable mass! (*erm*). Whenever you hit a box it changes direction. The magnetic field is also activited and shown as a circle. When boxes have an active magnetic field and are close to eachother the bigger box will consume the smaller one. 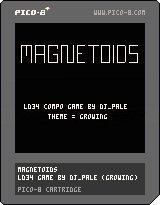 In Pico-8 the source is embedded in the cart PNG image. The magnetic idea is great. I like how you need to keep some box around by shooting them to invert their velocity. Really nice take on the theme. I had some trouble understanding how the mechanic worked, so I was mostly playing asteroids :P It has a really awesome retro-feel. Good job! I got it the second time I played. I was just shooting stuff. You got attract them and make them absorb/grow. Plays very well when you get it. Really great twist on asteroids! Really good "feel" too it. It's hard as hell, but it fits well with the teme. Nice game! Clever twist on Asteroids. I'm having some performance problems after playing for a few seconds in Chrome, so I can't really play it. But it seems like you can't move, only rotate? Makes it pretty difficult if you can't dodge. @csanyk: Only rotation and shooting - that's right :) If you have performance problems, please check the BBS (http://www.lexaloffle.com/bbs/?pid=17772&tid=2898&autoplay=1#pp). Or if you have Pico-8, you can try the cart directly. I like the idea of putting the 'asteroids' back together, but in practice a bit difficult frustrating. Really wanted to fly the ship around a bit too! Pretty difficult, but also pretty fun! Nice idea! Very nice minimalist game that blends perfectly two game types together to fit the theme. Love the retro art style. Tricky gameplay, but nice. I like the sounds. I found it very challenging to hit the boxes exactly once to change their direction, it was very hard - it does inspire me to create some asteroids like games with non-standard ways of winning however (e.g. use tractor beam to rescue people while causing asteroids to reverse direction rather than destroying them, something like that).